Calling The Buffalo bronze statue, inspired by Frederic Remington, is handmade and cast in the traditional Lost Wax Casting Process. 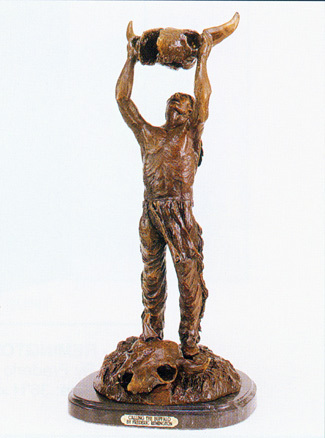 This is a multi step process that insures a quality bronze sculpture that may be passed down from generation to generation. This is a very popular inspired by piece. It has been mistaken and recognized as a Remington for over 50 years. Inspired pieces by Remington were not done by Remington, but made by various artists inspired by paintings that Remington had done in his lifetime. Inspired pieces were made after Remington’s death.